BAGLEY – Raymond F. Powell, age 81, of Bagley, passed away on Thursday, April 4, 2019, at Mercy Medical Center in Dubuque, IA. He was born on December 28, 1937, in Potosi, the son of Carl and Barbara (Kress) Powell. Raymond attended British Hollow Country School. After school, he worked various jobs to support his family. Raymond married Irene Stark and resided in Potosi. He worked at the Dubuque Packing Company in Dubuque, retiring in 2000 and moved to Bagley. He enjoyed the outdoors, flowers and birds. 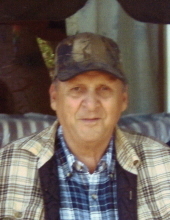 Raymond loved animals and hunting, fishing and trapping. He was a generous, feisty, and hardworking man who will be greatly missed. Survivors include his children: Barb (Tom Poppe) Powell; Bill (Dawn Ford) Speth; three grandchildren: Amanda Boen, Tabitha (Jesse) Cable, and Brad Speth; five great-grandchildren: Kaitlyn (Noah), Keegan, Kaden, Davin and Grayson; two siblings: Jack (Marylee) Powell and Paulette Abing; a sister-in-law, Kathryn Powell; his beloved dog, Nikki; other relatives and many friends. In addition to his parents, Raymond was preceded in death by a son, David in infancy; a brother, George Powell; a brother-in-law, Richard Abing; and his dog, Taffy. Funeral services will be held on Monday, April 8, 2019, at 1:00 p.m. at Martin Schwartz Funeral Home & Crematory in Bloomington with Reverend Pamela Strakeljahn officiating. Burial will be in Bagley Cemetery, Bagley. Family and friends may call on Monday from 11:00 a.m. until time of services at the funeral home. To plant a tree in memory of Raymond F. Powell, please visit our Tribute Store. "Email Address" would like to share the life celebration of Raymond F. Powell. Click on the "link" to go to share a favorite memory or leave a condolence message for the family.